While no fan of Sean Hannity and his Neuro-linguistic spin, the guest speakers may have truthful things to say and share. 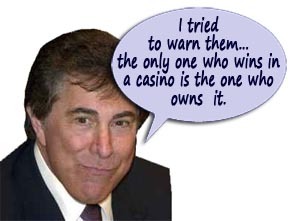 Casino magnate Steve Wynn expresses his disappointment at the lack of discussion of the economy during the course of the presidential election in an interview on Thursday’s Hannity. Wynn also weighed in on the debate describing it long on negativity and short on substance. Wynn said the printing of money by the U.S. Treasury under the guidance from the U.S. Federal Reserve and the national debt have not been properly addressed albeit a short segment at the final debate. Wynn also addressed health care and said the more than 10,000 people he employees “paid more money but did not get more coverage” under Obamacare. “All of my employees [have] increased health care costs in spite of the fact the company picked up most of the increases but yet they have the same policy that they had before,” Wynn said. WYNN: I watched the debate at my home in Las Vegas with my wife. I think the reaction has been what my reaction to the campaign has been. That is that long on negative energy and short on substance. Both parties. Chris Wallace asked terrific questions and I thought Chris’s handling of the debate has been the best I’d seen and his questions were well considered. Especially the ones on the economy where the problem really lies. Our deficit — we take in $3.1 trillion and we spend $3.7 trillion. And that $600 billion deficit at the rate of $50 billion a month. Our government is printing money and it’s degrading the living standard of every person in America. It’s the cause of frustration, anger and confusion. I was disappointed we didn’t get in a real substantive conversation about that last night. And frankly, except for the Senate race, I’ve been frustrated with the campaign so far. I know both people. I know they’re very intelligent people. Sometimes, it’s hard to tell because they skirt the issues. I know that both Hillary and Donald could take a much more healthy bite at these problems if it weren’t for the nature of this campaign this year. It’s been very distressing. I never thought that I’d see anything quite like what we’re having this year. So when I watch the debate, I’m like most Americans. I’m scratching my head a lot of times at the negative energy of both sides and wishing that it was otherwise. WYNN: I can tell you, after speaking to my 12 or 13,000 employees, that there is tremendous confusion and dissatisfaction with the cost of health care, all of my employees increased health care costs in spite of the fact the company picked up most of the increases but yet they have the same policy that they had before. They paid more money but did not get more coverage. And I discussed that with Harry [Reid] and other people that would listen because we’ve been health care providers for over 45 years. And when your prices go up and your product doesn’t get any better you sort of wonder whether you got a new deal or not.